I am very happy to present the Annual Report 2016-17 of Eicher Motors Limited (EML). It has been a spectacular year of all-round performances and achievements. We have achieved record sales and profits once again, and we have made significant progress on several initiatives and projects that we had set out to accomplish this year. 2016-17 was another strong year in delivering profitable growth and further strengthening the robustness of our business model. Comparing 2016-17 to 2014-15, Royal Enfield’s sales volume grew by 101%, market share in 150cc and above category of motorcycles grew from 21% to 24%. At Royal Enfield, we charted out an unconventional path for ourselves several years ago, to create an adventure motorcycling culture in India through relevant products, retail experiences and community engagements which have enabled us to achieve a significant brand following. Today, we have emerged as one of the strongest motorcycle brands in the country with a healthy order book and a unique mindshare amongst customers, which was inconceivable a decade ago. We are now ready to take this to the next level by introducing and building the Royal Enfield brand in other important markets around the world. Last year we faced several challenges that impacted our industry, such as the severe cyclone Vardah that hit Chennai, the sudden change in implementation dates for BS IV emission norms, and demonetisation. These created adverse situations for the industry, Royal Enfield successfully withstood all of these challenges and delivered strong performance without any disruption. EML’s Consolidated net revenue from operations for the year 2016-17 was Rs. 7,033 crores, a growth of 35% over 2015-16. In 2016-17, EML’s Consolidated EBITDA grew 50.9% to Rs. 2,174 crores and PAT grew 45.8% to Rs. 1,667 crore. In terms of margin, EML Consolidated set a new industry benchmark with an EBITDA margin of 30.9% in 2016-17*. The sales volume for the year was 6,66,135 motorcycles, a growth of 31.2% over the previous year. This enabled us to enhance our market share in the 150cc and above category of motorcycles in India from a mere 4.7% in CY 2011 to 24% in 2016-17. VE Commercial Vehicles (VECV) EML’s joint venture with Volvo Group had a good year in tough market conditions. VECV ’s Consolidated net revenue from operations for the year 2016-17 was Rs. 8,549 crores, a growth of 10.5% over the previous year. In 2016-17, EBITDA and PAT of VECV grew 4.0% and 3.0% respectively, over same period last year. Sale of commercial vehicles grew 12.9% to 58,604 units driven by a strong growth in sales of heavy duty trucks (23.1%) and exports (23.4%). Royal Enfield has grown from strength to strength in the last few years. However, we still have a large headroom for growth. In developing markets, especially India, the two-wheeler market is dominated by the sub 250cc commuter segment. I believe, with rising incomes and the increasing aspiration for leisure motorcycling, customers from the commuter segment will gradually shift towards the middle weight segment (250- 750cc) that is dominated by Royal Enfield. With strong domestic dealer network, growing international presence, exciting new product line-up, enhanced research and manufacturing capabilities, Royal Enfield is well-positioned to grow the mid-sized motorcycle segment in India and also in the international markets. Towards its ambition of becoming a global leader in the mid-sized motorcycle segment, Royal Enfield is investing in brand and market development and is focusing on opening new retail avenues across all major markets. Our success in the mid-size motorcycling segment has attracted many other players from within and outside the country. While their entry will help to develop the leisure motorcycling segment further, I am confident that with our extremely strong value proposition and a highly differentiated brand, we will maintain our stronghold on the market. At the same time, the tremendous potential of our brand and business and our successes in the last few years have not made us complacent. We will continue to play to our strengths while working towards enhancing customer experience and engagements across all touchpoints. In February 2016, we introduced the Himalayan, our purpose-built adventure tourer. Designed grounds up, the motorcycle is powered by a new LS 410 engine. 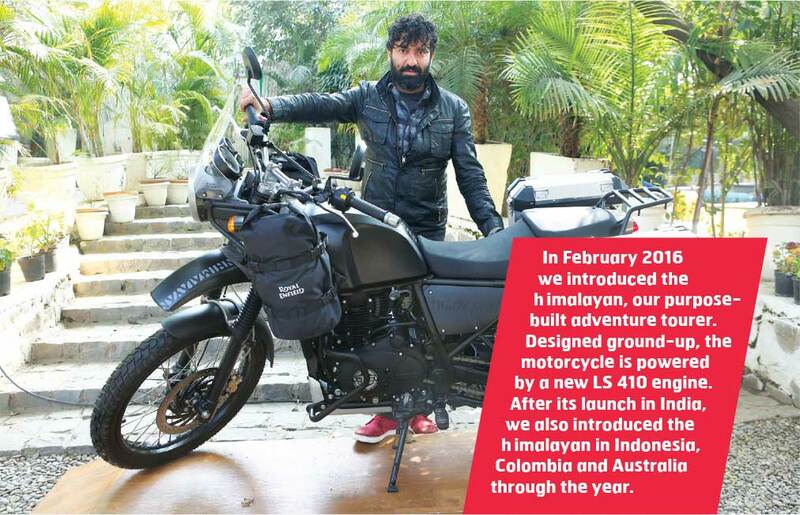 After its launch in India, we also introduced the Himalayan in Indonesia, Colombia and Australia through the year. We also showcased the motorcycle in Europe and UK. With this motorcycle we aim to create and grow the adventuretouring category in India and to create a simple, accessible, stripped down ADV (as the adventure-touring category is known) in other markets around the world. The Himalayan has received very encouraging reviews and feedback from media and enthusiasts across markets and we will continue to work towards developing this category further. In the beginning of the calendar year 2017, we also introduced the Classic 350 Redditch Edition inspired by the paint scheme of the 1950s era of Royal Enfield motorcycles that were produced in the United Kingdom. These three new colours, in our rapidly growing Classic 350 franchise, were received very well by our customers. In addition to motorcycles, Royal Enfield’s Gear business entered into an unique association with Happy Socks (a leading European brand for designer socks and men’s innerwear) to launch a limited-edition, multi-product line capsule collection of apparel and accessories for men. The collection included motorcycling jacket, sweatshirts, t-shirts, helmets and a series of socks and boxer briefs. Royal Enfield continues to expand its footprint in India, enabling customers and enthusiasts to ride more. We now have 675 dealer touch points across the country, attached to a wide service network commensurate with our motorcycle population. To add to our service experience for customers, Royal Enfield introduced its Roadside Assistance facility this year. A central contact centre was also established for registering sales and service queries and issues. Royal Enfield has been at the forefront of creating a differentiated motorcycle retail experience in the country. Throughout the last three years we redesigned all our stores to reflect our new brand retail identity that is inspired by a motorcycle enthusiast’s living room. Now with the hardware in place, we are initiating another enormous project aimed at introducing a truly world-class customer-oriented dealership experience at the Royal Enfield stores. In 2016-17 alone, we conducted more than 4,500 rides from our dealerships across India. More and more customers are riding out everyday exploring cities, discovering terrains and finding themselves through the joy of riding. The successful year-on-year ritual of our annual community gathering at Goa for Rider Mania is a testament to our thriving community of riders. In its 13th year, Himalayan Odyssey, our most celebrated annual ride from Delhi to Khardung La, Leh, saw a special women’s edition with a group of 20 women riders. On the back of the Himalayan, Royal Enfield also launched Unroad and Escapade, two new and unique ride experiences that invite more people to ride pure. Towards our aim of leading and expanding the mid-size motorcycle category globally, we have been making strategic forays in international markets. Our unique proposition of simple, evocative, all-round motorcycles have found many takers in markets like Colombia, Thailand and Indonesia where the motorcycle industry is akin to our home market - India. The evolved riding culture in these markets resonate very well with the Royal Enfield brand and has led to an encouraging acceptance of our motorcycles in the very first year of our operations in South East Asia in 2016-17. We are working very closely with our customers and channel partners to strengthen our foundations here. While the markets of South East Asia and Latin America have a huge potential to accelerate our volume growth in the coming years; our authority as a global motorcycle brand will also be established with our success in the thought leading, mature motorcycle markets. Towards this we opened our first exclusive store in Milwaukee, North America this year. We also opened several other exclusive stores throughout the year across our key international markets, the most recent being in São Paulo, Brazil that opened in April 2017. Today, Royal Enfield is present in leading cities of the world with 25 exclusive stores and 568 multi-brand dealerships. The exclusive stores follow our unified global retail identity, designed as meeting spots for motorcycling enthusiasts. In addition to motorcycle and gear purchase, customers also come to attend in-store programmes and ride-outs. In international markets, along with our retail footprint, we have been showcasing our motorcycles, gear and custom capabilities at various enthusiast and community forums such as Moto Expo 2016 in Bangkok, Kustomfest in Jakarta, and Wheels and Waves Festival in Biarritz, France. This year we also moved to our new Tech Centre at Bruntingthorpe Proving Ground, Leicester, UK. The area for office and testing is spread over 36,000 square feet. The main building currently has 100 employees with a capacity to house 150. The tech centre team includes members of the engineering, product design, product strategy and other technical teams to work on advanced R&D projects. This is a significant milestone at Royal Enfield that will go a long way in preparing us for the future. In addition to the UK Tech Centre, we have also been building our manufacturing capacity. After starting commercial production in 2013, the millionth motorcycle was rolled out from our Oragadam plant in February 2017. Our third manufacturing facility at Vallam Vadagal, Tamil Nadu, is on track for start of commercial production in August 2017. We have strengthened our team at Royal Enfield by adding 500 new employees across the globe and streamlined practices and processes to empower our team across levels. VECV, our joint venture with the Volvo Group, reported strong performance for second year in a row. Despite intense competition and slowdown in commercial vehicle industry, VECV outperformed industry growth rate enabling us to enhance our market share in the segment. While the sales volume of Eicher Light to Medium Duty Trucks (5-15 tonne) and Volvo Trucks reported decline of 0.6% and 6.4% respectively, sales volume of Eicher Heavy Duty Trucks and Buses posted robust growth of 23.1% and 16.5% respectively. Export of trucks and buses registered a growth of 23.4% driven by strong demand from Bangladesh, Nepal and Sri Lanka. During the year, we also successfully transitioned all our models to BS IV compliant norms. In the Eicher Trucks and Buses business, we made significant investments towards new technology infusion, capacity enhancement and market development for sustained growth and long-term value creation. In trucks segment, we see opportunities to grow our market share across key industries like e-commerce, mining, infrastructure, construction, FMCG, and white goods. We have successfully completed the development of our new model Pro 5000 which shall be launched in the market in the coming year. In bus segment, our newly launched Skyline Pro has received good response. We have also commenced production of the upgraded Starline range which shall be launched in the market in the coming year. In the Volvo Trucks business, we expanded business to different applications like granite mining, quarry and road construction to reduce dependence on coal segment. Expectation of higher coal production is likely to enhance demand in the coming year. With rising investments in the infrastructure sector, renewed focus on roads and highways construction and increasing port traffic, we expect VECV to continue this growth momentum. Besides, we are very optimistic about the upcoming commissioning of the BS VI norms in 2020 as we have distinct competitive advantages in terms of technological superiority, experience and existing set-up. In fact, at present, we are already exporting Euro-6 compliant engines to Europe. We have all the capabilities that will be adapted in line with the cost structure relevant to the Indian market. The implementation of the new Goods and Services Tax (GST) regime from July 1, 2017 will transform the face of commercial transportation in India. GST will, in time, create a seamless marketplace for transportation that would require greater up-time for trucks, less idle hours, faster turnaround and a more optimal warehousing structure. This will require an upgrade of the country’s truck fleet to upgrade to a modern truck fleet. VECV’s Pro series was designed and developed with exactly this intent. In coming time, Pro series will have a great opportunity to lead commercial vehicle industry’s move to modernisation. EPPL, our joint venture with Polaris Industries, is witnessing good traction in the market for Multix, a 3-in-1 personal utility vehicle, especially from independent business owners. In 2016- 17, we sold 1,640 units of Multix, while expanding dealer base from 30 to 74 dealers. The Company also entered new markets of Kerala, West Bengal, Odisha, Jharkhand and Assam among others. We successfully developed and launched the BS IV compliant model. During next year, apart from expanding distribution, we have plans to establish distribution network in the international markets like Nepal and Bangladesh. Given the increasing acceptance of Multix in the Indian as well as the international market, we expect EPPL to witness growth in the coming years. At EML, we have created a business model that has enabled us to achieve a strong and sustained growth over the years. While we have been on a solid growth trajectory, we are not taking things for granted. We continue to work resiliently towards areas of improvement and sharpening our approach to effectively respond to changing market dynamics. We moved into the new financial year with a full motorcycle portfolio compliant to the new BS IV norms. For the year 2017-18, Royal Enfield intends to make significant capex investments amounting to Rs. 800 crores, which shall be funded by internal accruals. This investment would be in line with our global expansion strategy for enhancing both capacities and capabilities. The key areas would include completing the construction of our third manufacturing unit at VallamVadagal, setting-up two technical centres in the UK and India and augmenting new product development. To serve our consumers across the world, we will also be producing 8,25,000 motorcycles at Royal Enfield in 2017-18. In 2017-18, we plan to invest Rs. 450 crore in VECV towards new product development and capacity enhancement. Our businesses are fully geared to operate in the latest tax regime under the GST. * EML’s Consolidated net revenue and EBITDA do not include the financials of its joint ventures - VE Commercial Vehicles and Eicher Polaris since that EML adopted Ind AS accounting standards from January 1, 2015. The profit/ loss of joint ventures is accounted under equity method and are included in EML’s Consolidated PAT.